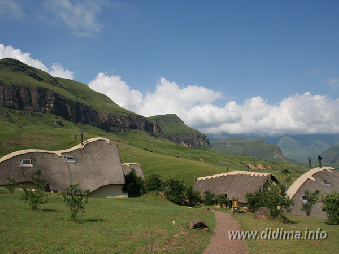 Didima Camp is situated next to the upper Thukela area in the north and east, Lesotho in the west and Monk's Cowl in the south, this part of the Ukhahlamba Drakensberg Park is 32 000 hectares in size. Including the outstanding Didima Valley with its many examples of San Rock art, it is a walkers paradise providing routes that range from a few hours to several days. For the travelers less inclined to physical activity or whose time is limited, Mike's Pass provides an opportunity to drive to the top of the Little Berg near the head of Didima Gorge for stunning views of the main escarpment and the adjacent lowlands. Overhead the uncomplicated flight of a Bearded vulture (Lammergeyer) while closer at hand Malachite sun birds display from protea to protea, a noisy troop of baboons bark at the intruders in their territory and a family of Mountain reed buck show their white tails as they race up a nearby slope. Didima Camp is themed to the San People and their rock art and a contemporary intuitive interpretive Centre which allows Didima Camp visitors a glimpse into the lives of these first people who lived in the Didima - Cathedral Peak area.